Rise and Shine with a Savory Breakfast: The trend of protein-packed breakfasts is catching on…and back-to-school time is looming. 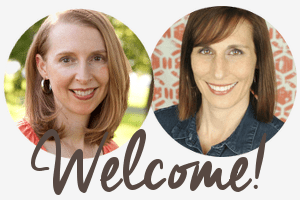 This month, show us new healthy takes on eating savory or dinner-inspired dishes for breakfast. 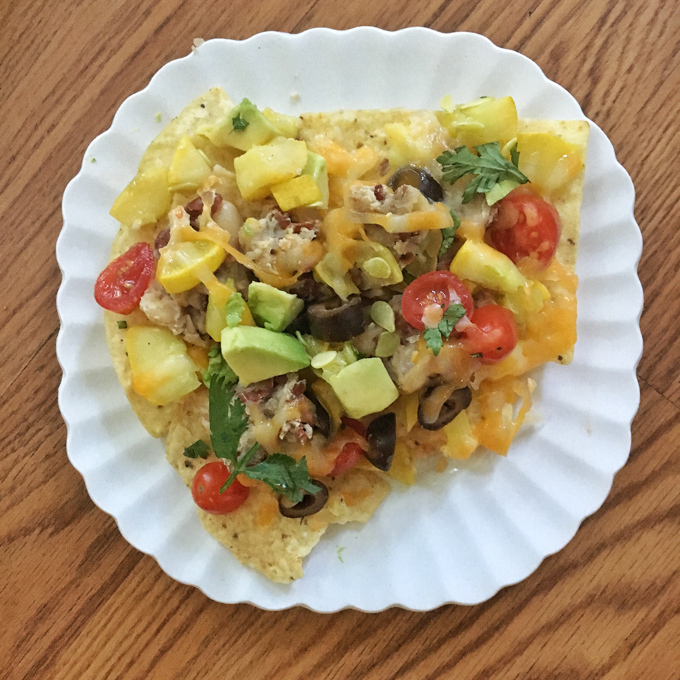 I’ve made Egg Mushroom Kale Breakfast Burritos and Mexican Street Corn Breakfast Tostadas so I figured why not a version of breakfast nachos? Granted, this isn’t a quick morning meal you can grab and go but if you prep the toppings the day before it only takes about 5 minutes to arrange and a few more minutes to zap under the broiler. And bonus: you can make individual servings and save the toppings for another meal. Not too shabby for a plate of nachos! Nachos for breakfast? This dietitian says yes if they’re packed with beans and veggies! Place a large skillet over medium heat and add 1 tablespoon oil. Add garlic and saute for 1 minute. Add squash, pepper and salt. Saute for about 10 -12 minutes or until squash has softened, stirring occasionally. Remove from pan and set aside. Mash beans with a fork in a bowl. Stir in cumin. Put skillet back onto stove and add remaining oil. Add beans and warm until heated through (2 – 3 minutes), stirring a few times. Remove from stove. 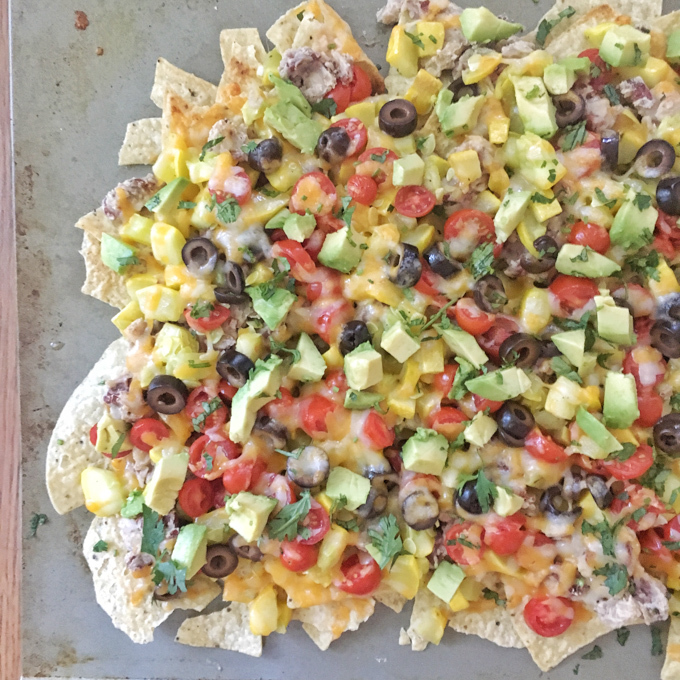 To assemble nachos, spread out tortilla chips on a baking sheet with a lip. Spread cooked squash and warmed bean mash on top. Sprinkle with cheese and heat under broiler until melted (about 1 1/2 – 2 minutes.) Keep an eye on your broiler so you don’t burn them. 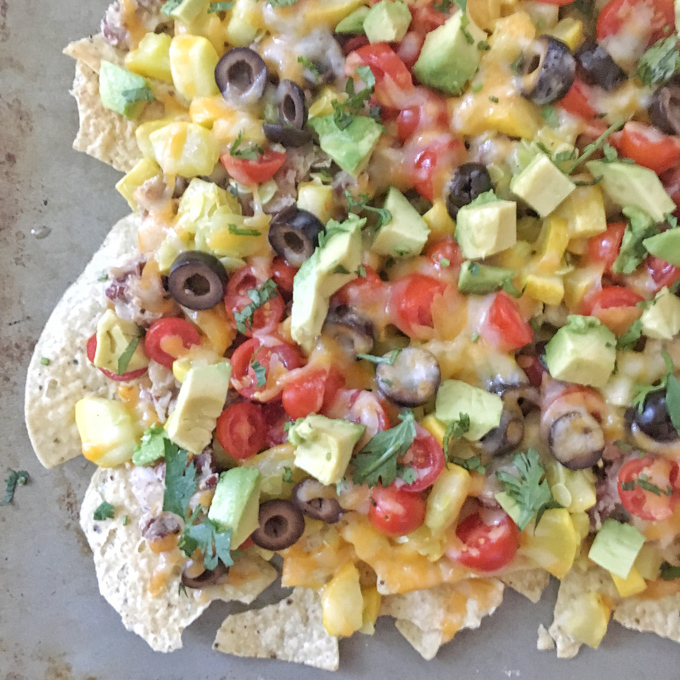 Remove and slide nachos off onto a serving platter. Top with tomatoes, avocado, olives and cilantro. Serve immediately. 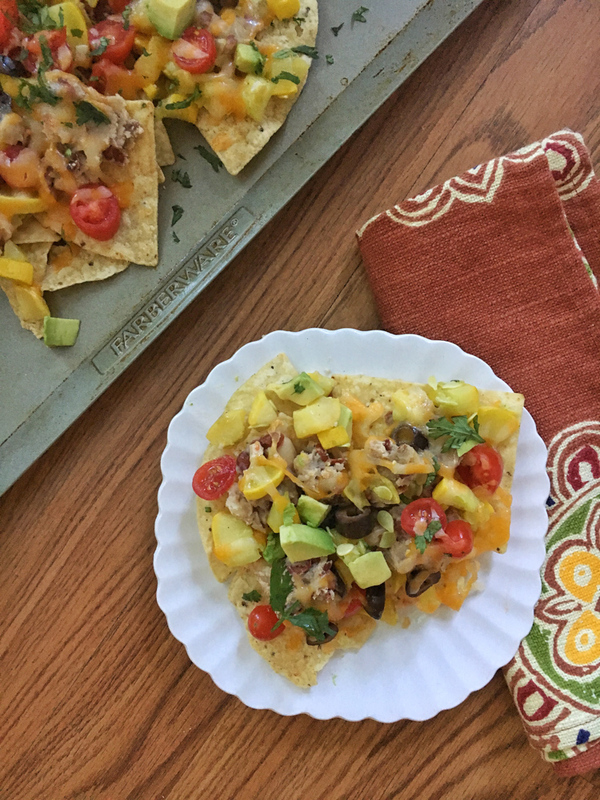 This nacho lover thinks this recipe is genius!! Nachos for breakfast? Why not! I’d have this for breakfast any day! I would definitely get out of bed to have some of these nachos! This is such a fun idea! So many great veggies, too!